A heat map is a visualization of data which uses color to represent data values in a two-dimensional image. There are many different types of heat maps used in different disciplines, each referred to by the term “heat map”, even though they use different visualization techniques. Most heat maps use mapping techniques to represent their data rather than charting and graphing techniques, thus providing unique views of data not available in charts and graphs. This article examines the most common types of heat maps and when each is used. The type of heat map used by Lab Escape’s Heat Map Explorer and Enterprise Tree Map SDK products is a tree map, which is the most common type of heat map in the business world. Tree maps, or “treemaps”, are the most common type of heat map. Used to represent large or complex data sets in applications ranging from stock market analysis, risk management, project portfolio analysis, market share analysis and network management, tree maps were invented by Ben Shneiderman at the University of Maryland in 1990. This is Part II of the “Live Dashboards using BO LiveOffice” Series. 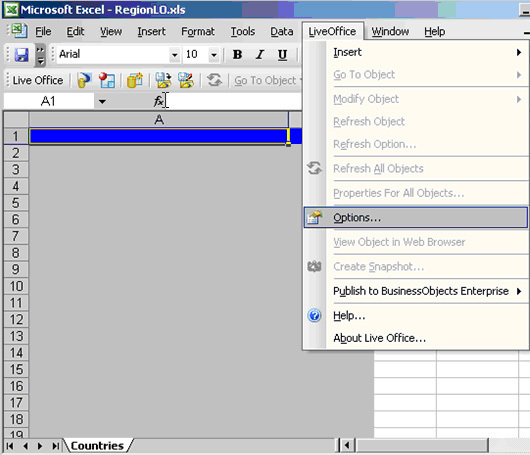 In Part I, Kalyan Verma Introduces LiveOffice and its connection with Xcelsius 2008. In this post Muhammed Ismail, walks us through the steps on “How to Create a LiveOffice Document and connect it to BusinessObjects Universe data”. To create Live Office document first open the formatted Excel template. Set the BO Enterprise credentials by selecting Live Office, Options from MS Excel. In this Series, Muhammed Ismail, an Xcelsius Developer at a Fortune 500 company, walks us through the steps on “How to create live dashboards using BusinessObjects LiveOffice and Xcelsius 2008”. This is a three part series. In Part I, Kalyan Verma, gives a brief introduction to LiveOffice and the connection between LiveOffice and Xcelsius. In Part II, Muhammed focuses on “How to Create a LiveOffice Document and connect it to BusinessObjects Universe data” and finally, in Part III, he will be focusing on “How to bind LiveOffice data to Xcelsius Components and create a live Dashboard”. LiveOffice is a Add-On provided by BusinessObjects that will enable the users to integrate BO Universe data with Microsoft Office, embedding up-to-the-minute corporate data in Microsoft PowerPoint, Excel, and Word documents. LiveOffice is included as part of the BusinessObjects Enterprise Premium license and the Business Objects Edge Series. 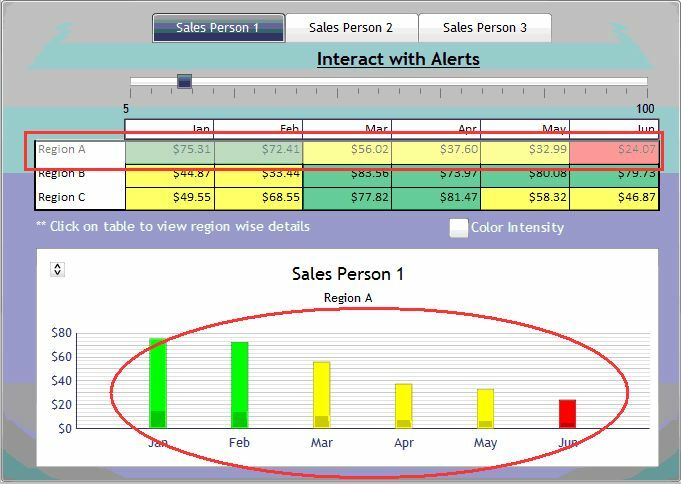 It is also available as an add-on to BusinessObjects Enterprise Professional. In this Post Srinivas Dandamudi of BIR Solutions shows us how to simulate Excel conditional formatting in Xcelsius 2008. The primary component of focus here is the spreadsheet component. If you are trying to use the Spreadsheet component in Xcelsius and expecting it to function like a regular Excel spreadsheet, then I’m afraid you are wrong. Unfortunately Xcelsius doesn’t support Conditional formatting for the Spreadsheet component. However here is an alternative to achieve the same. I used the rectangle component to simulate this functionality. Try the interactive model below and read the steps. I would recommend you to Download the Source Files at the end of this post and go through the steps while looking at the XLF model. Create a sample sales data excel file. Drag the Spreadsheet table component into the canvas and bind it to the resulted salespersons region values. After binding it to the display data we need to select the ROW and bind the source data and destination to the excel sheet. Drag and drop a Column Chart onto the Canvas and map the spreadsheet table destination to the Chart as Series. On the Chart Properties window, go to the Alerts tab and check the box which says “Enable Alerts”. Then under “Color Order” Select the radio button which says “High values are good”. Then create an Alerts table in your Excel model based on your targets. Check the values by using the formula =IF(G23<30,1,IF(AND(G23>30,G23<70),2,IF(G23>70,3,””))). The resulted table is as follows. Carefully place 3 rectangles for each cell on the spreadsheet component. Make sure that they are aligned properly on top of each other. The dimensions of the rectangles should be the same as that of a single cell on the spreadsheet component. 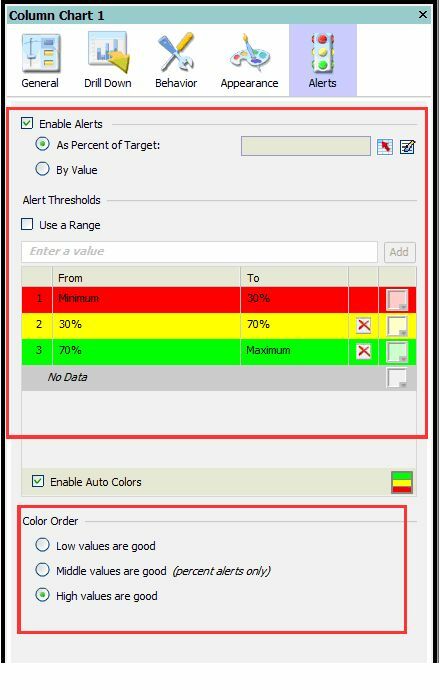 Color the rectangles Red, Green and Yellow and set the dynamic visibility appropriately. Display status: 1 for red, 2 yellow and 3 Green. If you have any questions related to the above post, please leave a comment or eMail Srinivas.